Housebroken: I’m working on it. I lived outside my entire life. Dislikes: Getting my nails clipped. Not my thing at all. Hey there! 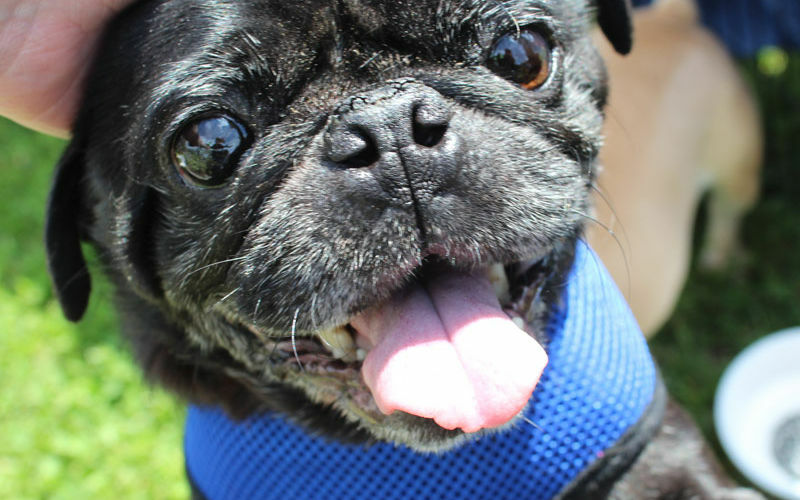 I’m Willard (call me Willy) the pug! I live with my foster mom and dad, and 3 other house pugs (1 female and 2 males). I get along great with everyone in my foster house! I really love going on car rides. They are my favorite. I like to sit in the back seat and politely watch cars out the window! I was an outdoor dog before I met my foster mom, but she says I’ve left that life behind me, and I don’t try to escape out of open doors. I like to take naps, and sometimes I like to keep my stuffed toys next to me when I sleep. I sleep in a kennel at night, but foster mom thinks I would do great in my own doggie bed at night. I like to sit at foster mom’s feet, and follow her around to keep her company. I don’t speak much, which foster mom seems to appreciate. When foster mom says “sit” “down” or “kennel” I know what I’m supposed to do, and I get lots of head scratches for being such a “good boy”. I really like attention and head scratches. A lot. I like my house mates, but I like foster mom the best. Foster mom says I am a very special and polite boy. She thinks I would get along with everyone, and I agree! I’m still working on house training. I wear a band and pad around my belly at all times, and I need someone who will keep working with me to remind me to potty outside. I can’t remember how old I am. The vet said I’m maybe around 7-9, but foster mom says I act and look much younger than that. My biggest wants for my forever home is to be with a family who loves me and takes me on the occasional car ride. I don’t ask for much, just to be loved. Interested in adopting? Willy’s minimum adoption donation is $275.